Bihar Police revealed the brand of slippers that angry teachers showed Nitish Kumar. The brand of all the slippers was Relaxo Footwear and all the slippers were durable and washable. Police confirmed that the slippers were not much clean but were very strong and could survive in any adverse condition despite their age was more than 7 years. "Yes actually slippers were really good in terms of durability and flexibility. They are very smooth and easy to move. According to Forensic Report, the slippers could survive in any adverse condition such as rains, floods and even extreme summer conditions," Ramnaresh Sinha, Deputy Commissioner of Police, Darbhanga. He said "They can mould as well and don't smell bitter too." Bihar Police collected samples from all the slippers that were shown in the conference that Nitish Kumar was addressing. While the issue was contractual teachers wanted to get promotion for permanent teachers, they were showing Relaxo Hawaii slippers indicating the symbol of durability. However, few anti-social elements such as media cried foul by saying that they were protesting. "We were actually saying Nitishji that look at these slippers which we were using since last 7-8 years and still in good conditions. It is a symbol of durability," said Jagdish Yadav, one of the school teachers. Relaxo Footwear Company is yet to confirm that it was the major supplier of slippers and sandals to Bihar teachers. 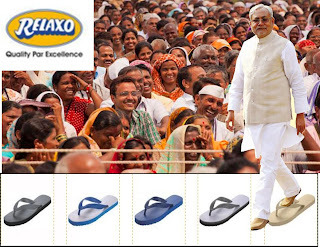 However, sources related to development said that the company is working on advertisement based on the concept of durable slippers shown to Nitish Kumar. Sources also said that the company is planning to appoint Nitish Kumar as the brand ambassador and promote its slipper brands on a large scale. On political front, according to sources Nitish Kumar confirmed that it was the power of Biharis that they showed through this action.